The issues that flow from Divorces or Decrees for Separate Maintenance (what South Carolina uses for a legal separation) can be obtained either through contested litigation or a settlement agreement. If there is an agreement, however, it is unenforceable unless approved by a Court and made part of an Order. Note, however, that there can not be an agreement for a divorce: you can agree on everything else, such as custody, alimony and property division, and you can agree not to pursue a fault-based divorce, but you just cannot put in an agreement that either or both will seek a divorce. Likewise, the grounds have to actually exist: you cannot falsely claim you’ve been separated for over a year when it has only been 6 months. Agreements can be negotiated between the parties themselves, or through their lawyers, or by way of mediation. In mediation the parties, with their attorneys, try to reach a settlement with the assistance of a third party known as a mediator. Usually one spouse and his attorney sit in one room, the other spouse and her attorney sit in another, and the mediator goes between the two conveying settlement offers. If the parties are motivated to resolve their differences and act in good faith, mediation can be an effective way to get things done. Even if the parties are acting in good faith, though, the touchstone for what is a fair settlement is, what would Judge do in contested litigation? In other words, why would a party accept a settlement offer if he or she could get a better result by going to trial? In other situations one of the parties may simply insist on unreasonable demands or the parties cannot trust each other. In that event a Court has to resolve the issues. Trials in the Family Courts of South Carolina are not jury trials. In most cases there are two “big” hearings in Court: the Pendente Lite Hearing, to resolve temporary issues during the pendency of the litigation, and the final Trial on the Merits, to resolve things in a final fashion – or as final as they can be. Periodic (i.e., modifiable) alimony, child custody, visitation and child support can be changed later down the road if there is a material change in circumstances, but all other issues like property division are final and non-modifiable after a Final Order or Divorce Decree is issued unless the parties agree otherwise. If a Trial Court issues an Order that one party still disagrees with, an appeal may be necessary. Only in exceptional circumstances can a non-final Order be appealed; the Appellate Courts prefer to wait until there is a Final Order before allowing the matter to proceed. If an appeal is filed, some things are automatically stopped, like the division of assets or a final award of attorney fees. Other things like a child custody award are not automatically stopped. To un-stop something automatically stopped, or stop something not automatically stopped, a Petition for Supersedeas can be filed but only in rare cases will they be granted. Quite simply, the Court of Appeals prefers to wait until the record from the trial is settled and both sides have filed their briefs before deciding the case. Most of the time oral argument is scheduled, but the Court of Appeals has the authority to decide the case on just the written materials that will have been submitted. If an aggrieved party is still not satisfied with the decision of the Court of Appeals, a Petition for Writ of Certiorari can be filed asking the South Carolina Supreme Court to hear the case again, but it is discretionary on their part to let matters go that far. Indeed, the Supreme Court has the authority to take the appeal away from the Court of Appeals and decide the matter themselves. The simple fact is that there is no single one-method-fits-all solution to domestic relations problems. 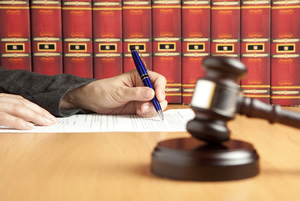 Some cases can be settled before litigation is even filed while others can only be resolved by going to court. Taylor & Potterfield’s more than fifty years of experience in Family Law can help guide the best approach in a particular case.